Silverspoon Hospitality Academy conducted the short course “Introduction to Hospitality Management” which was completed 28.11.2016 and covered four modules: Telephone Skills, Customer Relations and Etiquette, Housekeeping and Food and Beverage Management. 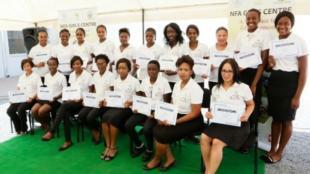 On the 30th of November 19 girls graduated from the short course. A small award ceremony at the NFA Girls Centre was attended by representatives of the German Embassy in Windhoek, ATC, NFA, GIZ, and Silver Spoon Hospitality Academy.